I CAN’T GET no satisfaction. I grew up wanting more, and why not? It was my culture, the late ’60s and 1970s. Even the Rolling Stones’ Mick Jagger wailed dissatisfaction over a girl dissatisfied with him. Mick ‘can’t get no satisfaction’ with TV ads telling him to be dissatisfied with less-than-white shirts, to be dissatisfied with his cigarettes — there are better smokes out there. In fact, everything else is better out there. So be cool: be dissatisfied. So I was. Dissatisfaction seeped into my soul, but most of all into my stomach. I couldn’t get no satisfaction from — food. 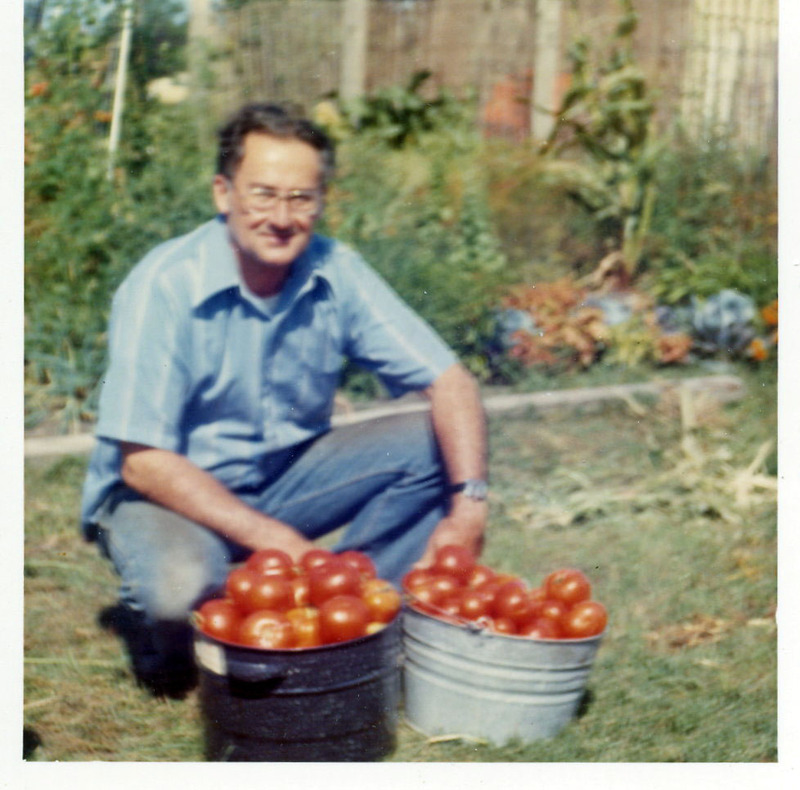 My dad with a day’s haul of his backyard tomatoes. GROWING UP IN MONTANA, our backyard burst with home-grown strawberries, organic beans corn, carrots, cucumbers, and my dad’s consuming passion: his dozen varieties of tomatoes, from heirloom to hybrid. 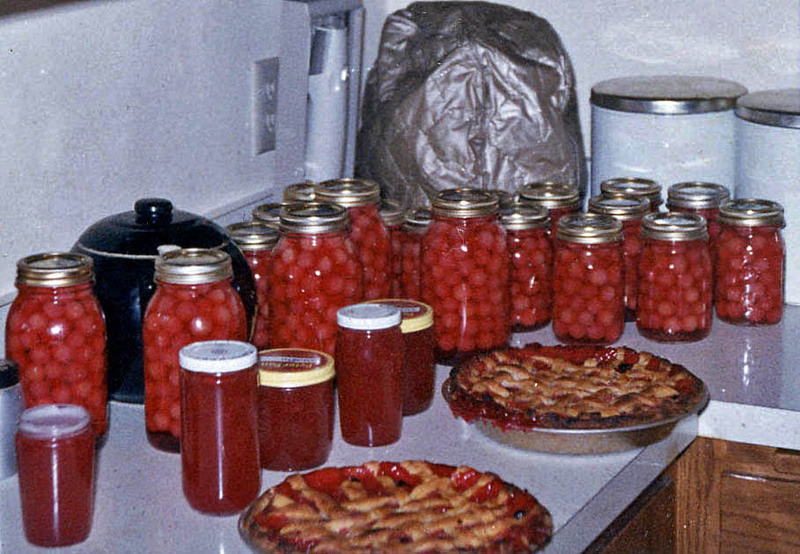 Harvest time: my mom’s canned cherries, jams, and prize-winning pies. Yet I preferred Hostess Cherry Pies. WE CANNED TOMATOES, beans, horseradish, cherries, and pears. Picked free chokecherries along country roads for jams and jellies. Made pizza from scratch on Saturday nights, watching “Gunsmoke.” Pigged out on Mom’s homemade garlic bread dripping with melted butter, pungent garlic cloves, and freshly grated cheese. On our relatives’ Montana homesteads, I plucked feathers from beheaded chickens in the kitchen sink, drank milk from cows whose udders I’d pumped earlier that morning. 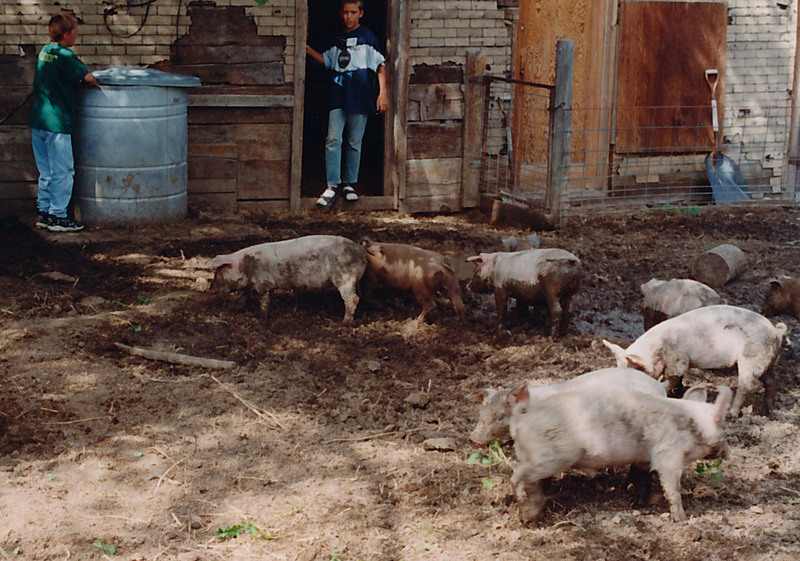 Played in the pigpen, knowing some hog might be that night’s main meal. (‘Bringin’ home the bacon’ really meant something to me.) 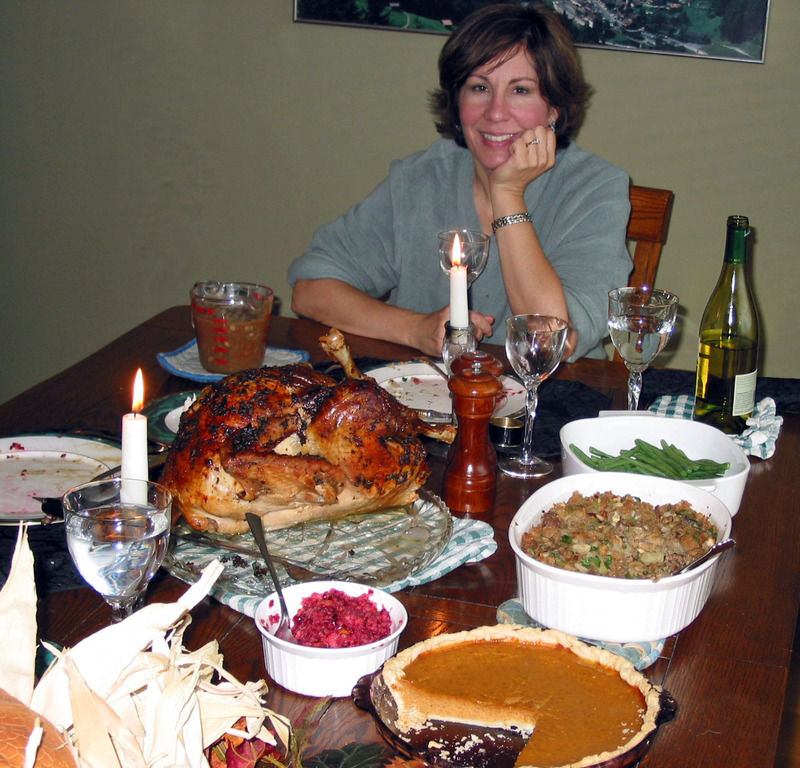 It was all from scratch: from bread, butter, and bacon to pickles, preserves, and pies. OUR LIVES were from scratch, scratching out livings as best my parents could try. And they tried, and they tried, and they tried. Ho-Hos. Hostess Cherry Pies and Ding-Dongs. Cheez-Whiz. Hamburger Helper, Spam, Dream Whip, and Jello. What could trump a Manwich with Pringles and Velveeta cheese? Fine dining was Swanson frozen fried chicken TV dinners along with what’s now ironically known as ‘white-trash garlic bread’ – made with Imperial Margarine/(fake) butter, Wonder (chemical) Bread, McCormick’s garlic powder, and Kraft preservative-filled powdered Parmesan cheese from a shiny green can–oh, and pass me the MSG, please. I craved them all, beyond the hunger pangs in my stomach. 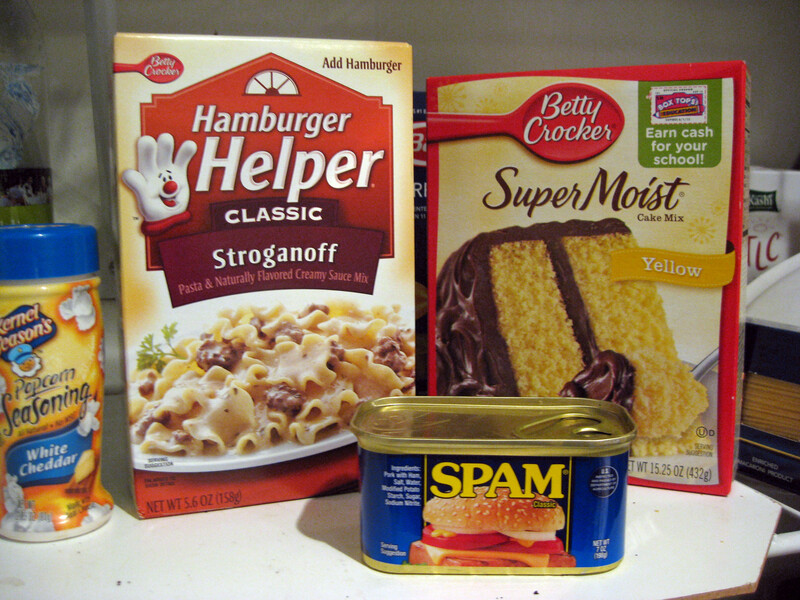 Hamburger Helper, instant cake mix, Spam: 79 ingredients and counting. 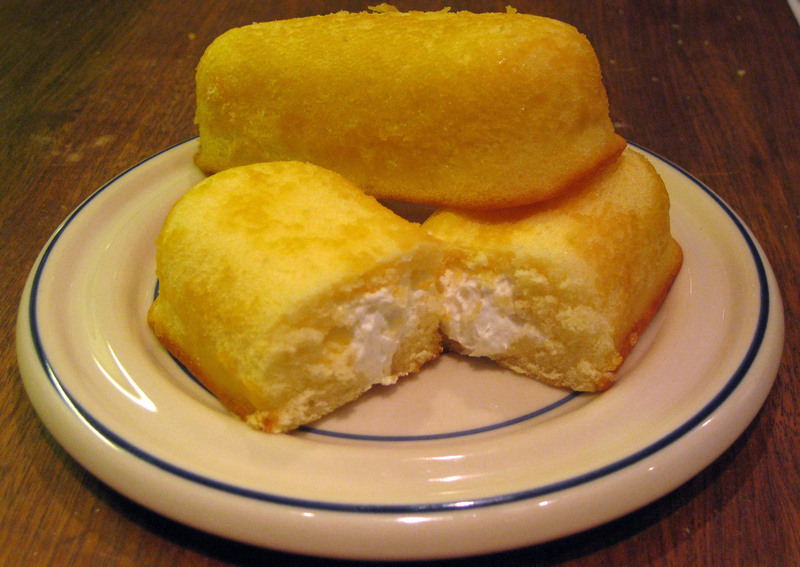 I HUNGERED for store-bought, processed, chemically-laden products: status symbols of wealth. They cost money, and you had to have money to buy them. So, in my young mind if you could buy that stuff, you were rich. In contrast, cheap natural foods made from scratch or grown in backyard gardens were obvious signs of financial struggle–my family’s struggles. White-trash hicks. White-trash kid. Worse, in school lunchrooms kids with lunch pails and homemade fare were branded, self-segregated to cafeteria corners while kids who paid for hot meals–pizza, tater tots, corn dogs–sat at the coolest, most prominent tables. I was no Rosa Parks of lunch-pail integration back then, but still longed–like a child’s nose pressed against candy-store glass–I longed for those 10- and 25-cent meals that would land me in the upper class of my class. 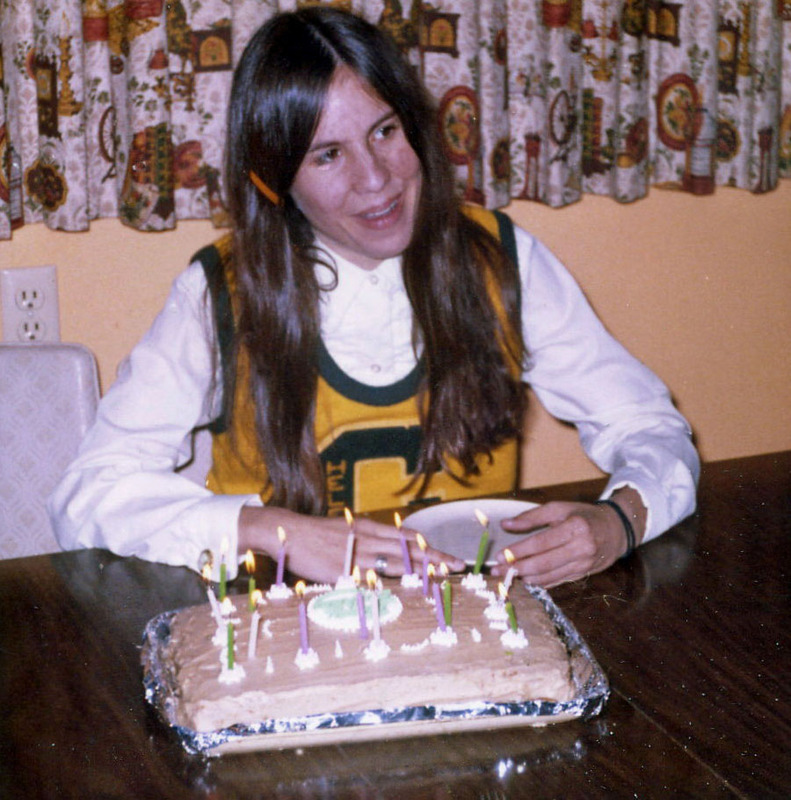 DECADES LATER, I cook everything from scratch. Decades later, I still struggle with class, social standing judged on the stock I come from, where I was born and now live, what I eat. It’s a sense of place DNAed into me, longing and yet knowing that no matter what I do or achieve I will never really ‘fit in’ to that higher social class–acceptance–I craved as a child, with store-bought processed food my gateway. I know better, now. I know my place. And yet, my childhood culinary dissatisfaction of our Montana homegrown, white-trash whole foods is now craved by those upper classes willing to spend ‘whole paychecks’ for local, raw, organic fresh fare. We are all so dissatisfied with what’s on our plates, craving that which eludes us even when the most nourishing sustenance is set before us, inviting us to eat, drink, and be filled. No videos, photos or content may be used without prior written permission. Additionally, some photos/content have been obtained through restricted publication parameters for use only on this web site. No videos, photos or content may be used without prior written permission.